From Leah: Stu with Lindy(L) and Ginger(R). Ginger is 5 months old and learning from her older sister. When not in training, Ginger is our daughter’s constant companion and playmate. Lindy is the best family dog too! My girls love her so much! My 1 year old leads her and she heels for her. I can’t say enough about Lindy and this breed! 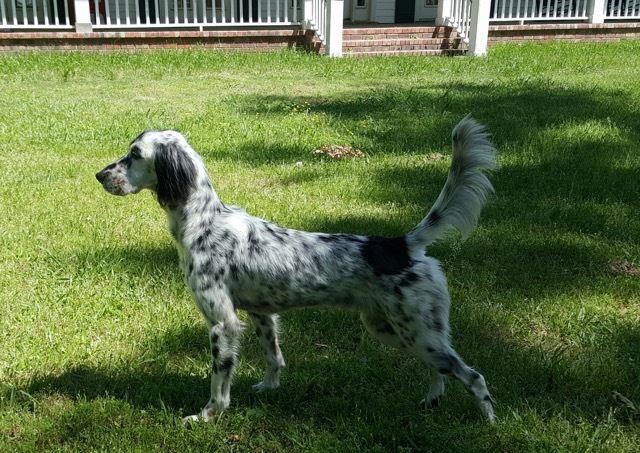 From Matt: Hello Joan, I bought a setter from you two years ago, I wanted to let you know that she is still doing great and made an excellent bird dog. Pearl is the sweetest dog I’ve ever had and couldn’t imagine her not being part of the family. Thank you for making it all possible; I’ve attached a few pictures of her growing up for you to see how she turned out. 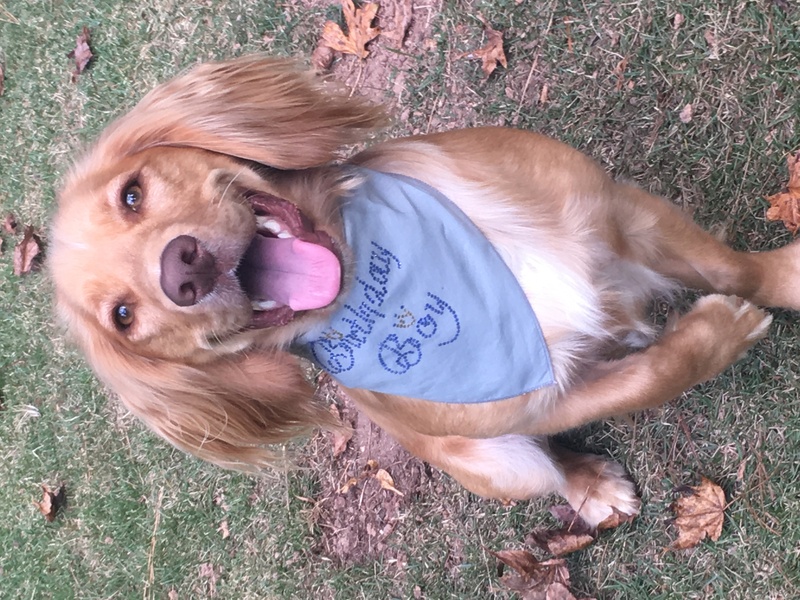 From Andrea: I just wanted to send you a picture of Cody on his first birthday and please feel free to post on your website! Cody is such a blessing to our family. He is a wonderful family dog and is so good and always wants to please his family. We just absolutely adore him and cannot imagine our lives without his sweet, loving and laughable personality in our lives! Thank you!!! From Sherry: (Our first video!) 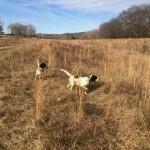 I bought a puppy from Joni 8 months ago and we named him Ozzie from the time we got him he was just a lovely animal he has made a super nice house pet plus we are working him for the field as we do pheasant hunts in the winter time and also go to Georgia for quail work in the fall Ozzie has been retrieving dead birds to hand since he was 4 months old he trains extremely easily he has been hunting birds for 3 months and finding birds and retrieving kills he is an amazing dog I wish I had a kennel full of them and I will be buying another one. From Katie: I purchased my beloved Teddy Ballgame from Wilderland Kennels in November of 2014. I couldn’t be happier with my puppy! Teddy has the sweetest disposition and is extremely smart. He loves all people, dogs and children. Joan was a pleasure to work with and answered all my questions. 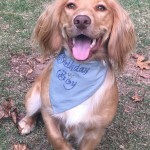 If you are considering getting an English Cocker, definitely get it from Wilderland! From Jase: “Timber has been the best dog and has really been a phenomenal addition to my life. 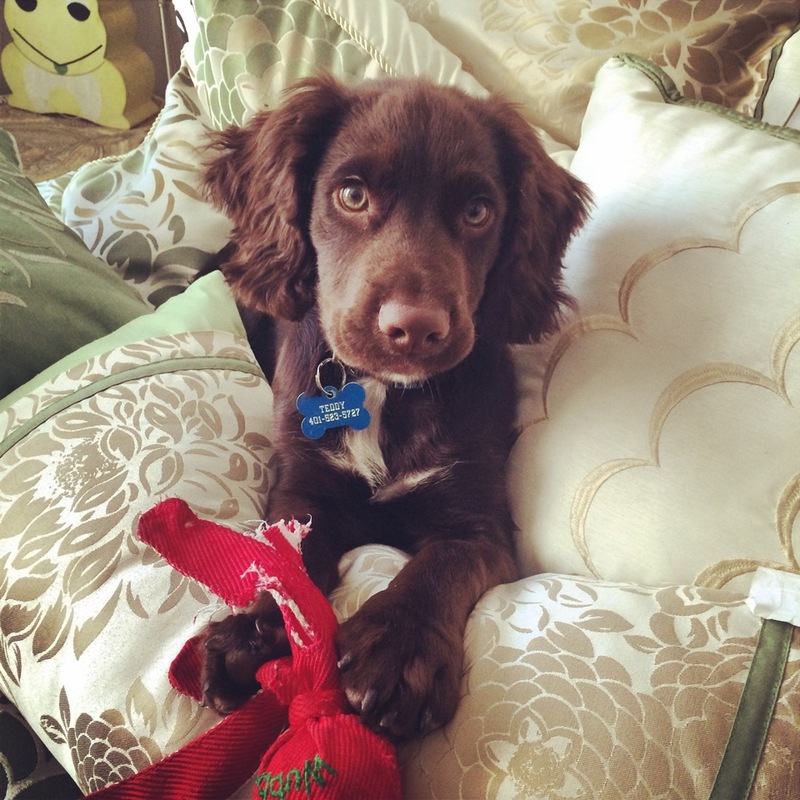 He is very obedient and has taken to his training really well! 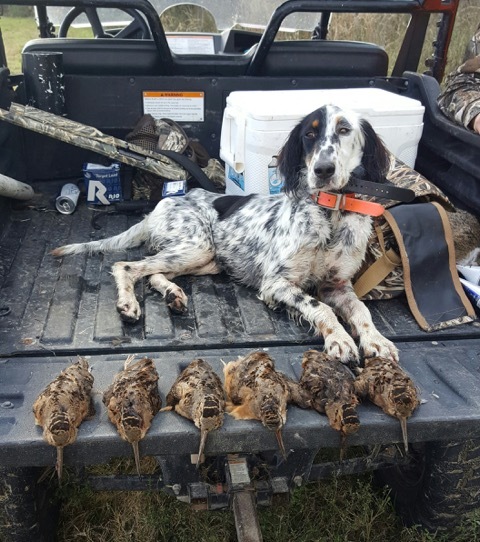 I have shot 163 quail over him and he has just exceeded expectations! 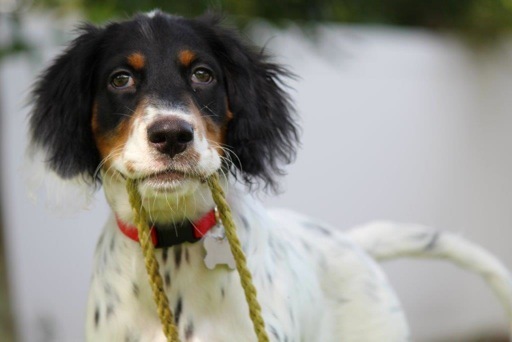 Timber is from the 2014 English Setter pup litter. From Melvin and Lisa “Our English Cocker female (Princess Leia 9/1/2014)) obtained from breeder Joan Newpeck at Wilderland Kennels is nothing short of outstanding. At only a few weeks old our pup displays so many great working dog qualities for pointing, retrieving, obedience and ease of training. In fact the pup has natural born instincts and it is the owner that needs to be trained and allow this purebred to do her work. We could not be more pleased with Joan’s selection of canine mating. The sire and dam come from field champion stock and coupled with Joan’s years of experience it shows. 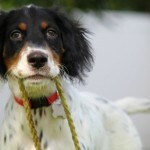 Without reservation we recommend Joan and would return to her first should we add to our number of dogs”. From Ron: I thought you might like an update on Abbey (5/26/2014 litter, now living in Ocala, FL). She’s a great dog and her disposition is fantastic. Thanks for a great companion! From Vicky: I just wanted to let you know how pleased we are with Kip. His temperament is wonderful and he is very smart. I hate to gush too much since it’s early in his life, but he sleeps all night, goes to the back door when he needs to go out, gets along with Hannah’s dog, torments our cat, and generally has been so fun! Even Steve (who has never wanted a house dog) admits to liking him–he’s even been caught holding and playing with Kip. He also has really good conformation and carries himself proudly. 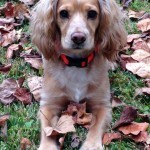 My name is Kimberly and my father in law, bought a puppy from you in July of 2011. She was born on May 29, 2011 and we named her Molly. I just wanted to tell you that she has brought so much joy to our lives and is simply perfect!! She love to run, play, swim and hunt! I just wanted to tell you thank you as I could not imagine my life without her! I hope all the puppies you have sold are as great as our girl. I have attached a picture of Molly. 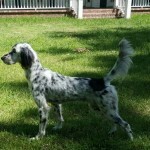 “My wife and I bought an English Setter from Joan. Our dog, Dora, is now 13 months old and has been an absolute dream. She has been trained and now will point birds, hold a point and retrieve dead birds. She also is a fine house pet. She stays in the house with us most of the time. We have been very pleased with her. Even though she is still really a puppy, she acts like a mature dog and she is a part of our family now. Joan was a pleasure to work with. We live in South Carolina so we did everything over the internet and telephone. Joan had Dora flown to us and she arrived happy and healthy. If I ever buy another dog, I will certainly contact Joan again. 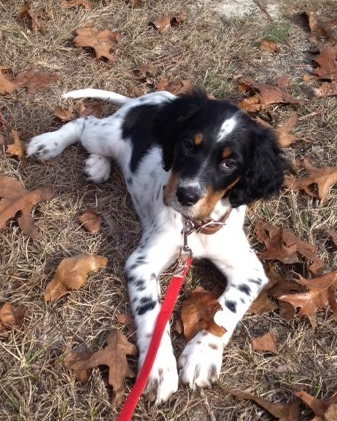 Update from Flo on Dora: Teddy Poston, our trainer, thinks Dora is great and wants her in field trials. 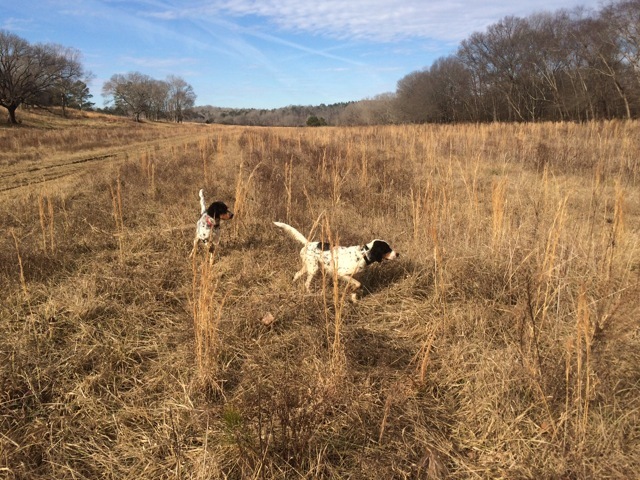 We took her to our farm yesterday and let her quail hunt. She was fantastic! Phil is so proud of her. We just love her. Thanks again for helping us choose the perfect pet. We will keep you posted on her progress. 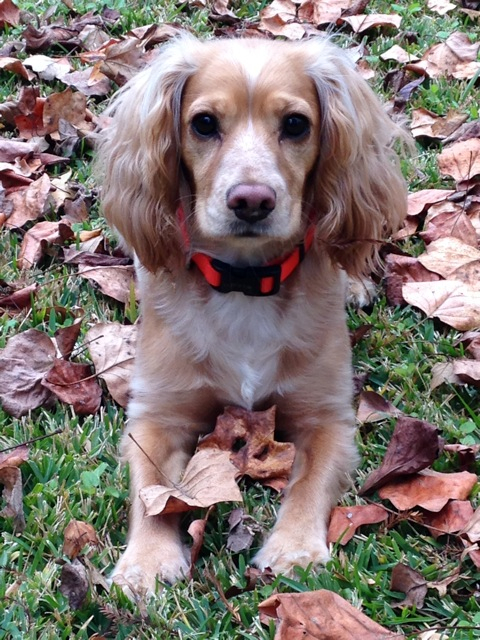 We bought an English Cocker Spanish “Lindy” from Joan March of 2014 and we love her like crazy. This dog is the best. 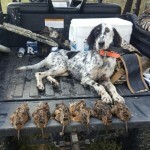 Lindy is very obedient fantastic with our toddler and an amazing hunter. The dog never runs out of energy you have to make them stop hunting but she doesn’t destroy anything if she is bored either. She loves all people and has zero aggression to people or other dogs. 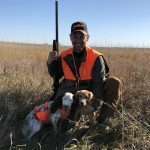 If you are looking for a bird dog and the best family companion you can’t go wrong!